Selecting the Logs button in the upper left hand corner of the Field Monitor changes the display to show a list of all completed matches. Users can select the Match Type using the dropdown box in the top center and then scroll to the desired match or search by team using the box in the top right. Clicking the green “Match/Play” button for a match will pull up the match graphs. Clicking an individual team button will pull up the station log for that match. Click the Field Monitor button to go back to the standard Field Monitor display. Clicking on the Match Description will bring up the scoring details, as described later. Clicking a match number from the logs page will bring up the Match log page. 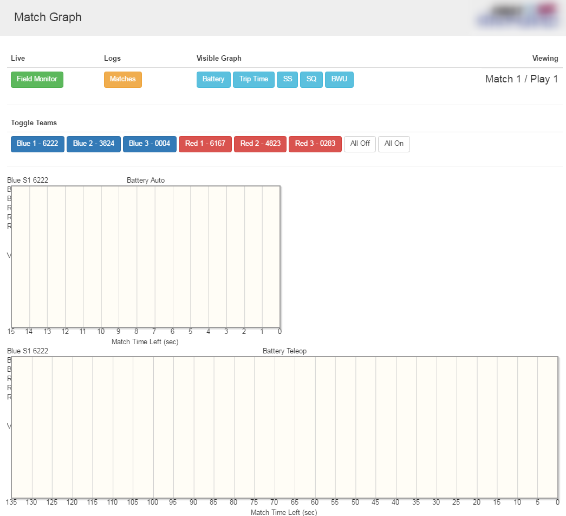 The Match log page shows Battery Voltage and Trip Time for each team in a match on a graph. On a full FMS setup it will also display Signal Strength (SS), Signal Quality (SQ), and Bandwidth Utilization (BWU). Click the blue buttons in the top center to select the desired data, and then use the buttons in the second row to select the teams to display data for (each row can be toggled). The top chart shows data for the Auto period while the bottom chart shows Teleop. To return to the previous screen, click the yellow Matches button. To go back to the Field Monitor, press the Field Monitor button. Clicking a team number from the logs page will bring up the Station Log page. This page will show a table containing timestamped entries of the data shown on the Field Monitor during the match (+SS/SQ for a full field). This detail page is accessed by clicking the Team number (blue or red buttons) on the "Matches" page. Scoring details can be viewed from the match logs interface, freeing the scorekeeper to continue running matches instead of entering Match Review. No edits can be made through the web. 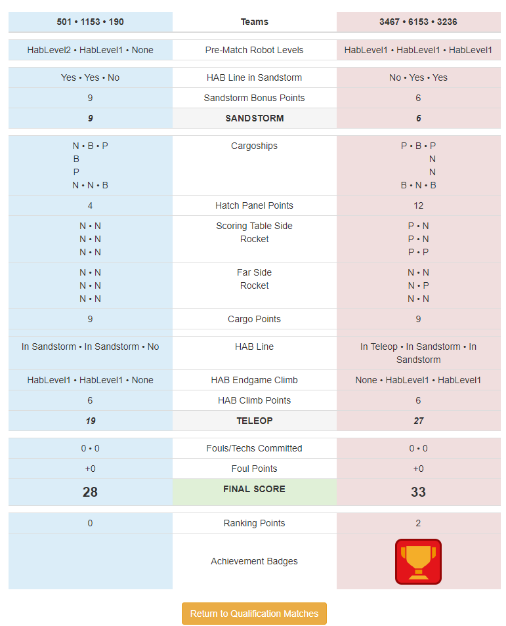 All information on the score detail page is considered "for reference only" and the only official source of information remains the scorekeeper. The Score Detail shown here is in a slightly different format than the data shown on the frc-events website (to the public). This is also where FMS shows the string it transmitted to the Robots (in the blue box at the top of the page).